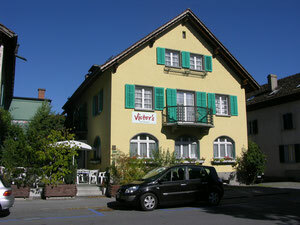 Welcome in Victor's Bed & Breakfast - victorshotels jimdo page! This small family business offers 6 different rooms on two floors. The rooms have been entirely redecorated and newly furnished, each one in a very personal style and atmosphere. The bathrooms are on the first and second floor offering the latest comforts. A lounge with free Internet access and a large TV is available for our guests. The small kitchen with refrigerator, microwave and a small oven can be used 24 hours a day. Enjoy the excellent cuisine and the traditional wine taverns (Torkel) in the immediate vicinity. Benefit from our region's excellent gastronomy. At the Restaurant Falknis you will find delicious, traditional cuisine with reasonable prices. During your stay, do not forget to visit the original Heidi's Village or relax in the nearby Tamina thermal springs.